Protect your hands from the heat and keep your hot drinks warm with this three colour mug jacket uk pattern, fasten through with a jazzy button or use one to match your colours. This post contains affiliate links. If you make a purchase after clicking on an affiliate link. I may receive a small commission (at no extra expense to you). fpdtr. Work dtr around front post of the dtr on row below. Crab Stitch. Working from left to right, work dc backwards. Row 2 – 1ch, 1dc into base of 1ch, 1dc into each st to end. Turn. Rpt from # to # once. Border – 1ch, 1dc into base of 1ch, 1dc into each of next 7st, 3dc into last st, working down first side of jacket work 1dc into each row end to corner, 3dc into corner, 1dc into each of next 7ch along the starting ch edge, 3dc into corner, work 1dc into each row end up second side of jacket, 1dc into corner, ss to first dc on beginning of row. Turn. Work crab stitch (see abbrev) into each dc on all four sides, on the second short side make a 15ch loop, in the centre (ie. crab st into 5dc, 15ch, crab st into 5dc), ss to the first dc on beginning of row. Fasten off. Finishing – Weave in and trim off loose ends of yarn. Sew on button to correspond with buttonhole, fasten button though loop. 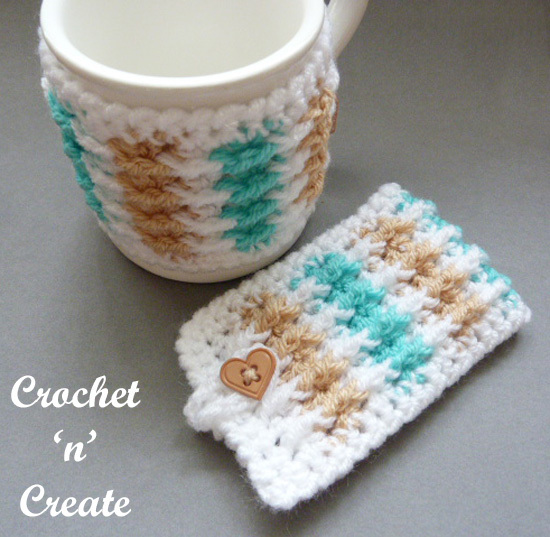 Hope you enjoy this free crochet pattern for mug jacket uk. Speak to you soon folks. The written instructions and the pictures for this free mug jacket uk pattern are copyrighted to crochet ‘n’ create © 2017. 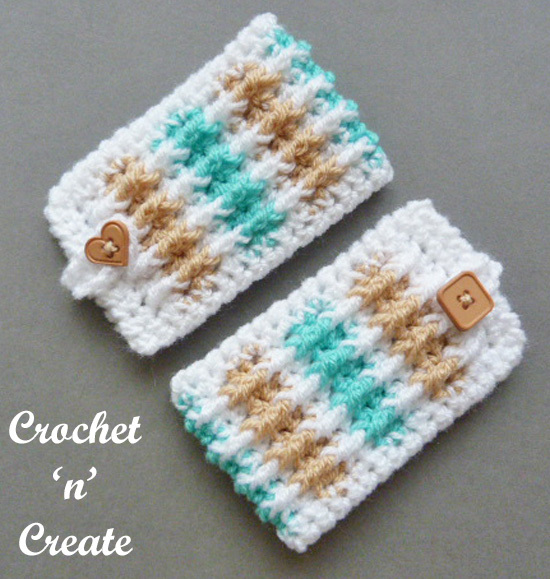 You are welcome to sell the finished products made from the free crochet mug jacket uk pattern, I just ask that you please use your own pictures and put a link back to crochet ‘n’ create. 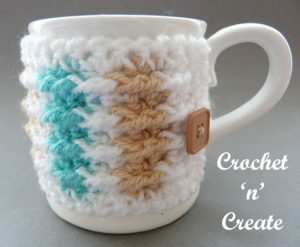 This entry was posted in crochet for the kitchen, crochet mug cosies and tagged crochet, crochet cozy, crochet mug cozy, free crochet patterns on 3rd November 2017 by crochetncreate.